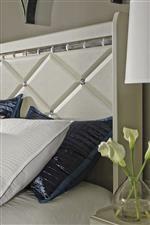 Make every day more glamorous with this swanky shelter headboard. It features a chic finish, a row of beveled mirror accent, and a diamond pattern center section of textured stipple finish with faux round crystals. This headboard requires a bed frame (sold separately). The Dreamur Twin Panel Headboard with Faux Crystals by Signature Design by Ashley at Ryan Furniture in the Havre De Grace, Maryland, Aberdeen, Bel Air North, Churchville area. Product availability may vary. Contact us for the most current availability on this product. Starting with a champagne pearl finish, this bedroom collection will transform the atmosphere of any bedroom. Designed to catch your eye are the faux crystal accents seen throughout on the diamond pattern textured panels and for hardware on drawers. The shelter shape on the headboard offers Hollywood-inspired style. 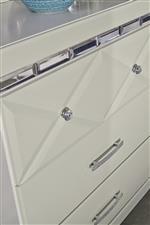 Beveled mirror accent trim adds a final touch of glam to accent each of the pieces available. The Dreamur collection is a great option if you are looking for Glam Contemporary furniture in the Havre De Grace, Maryland, Aberdeen, Bel Air North, Churchville area. Browse other items in the Dreamur collection from Ryan Furniture in the Havre De Grace, Maryland, Aberdeen, Bel Air North, Churchville area.